Welcome to the website of the Frankfort, KY Elks Lodge. We hope you enjoy your visit, and that you find all of the information you seek. Enjoy our latest news below, and if you have any questions, please feel free to visit our contact page. 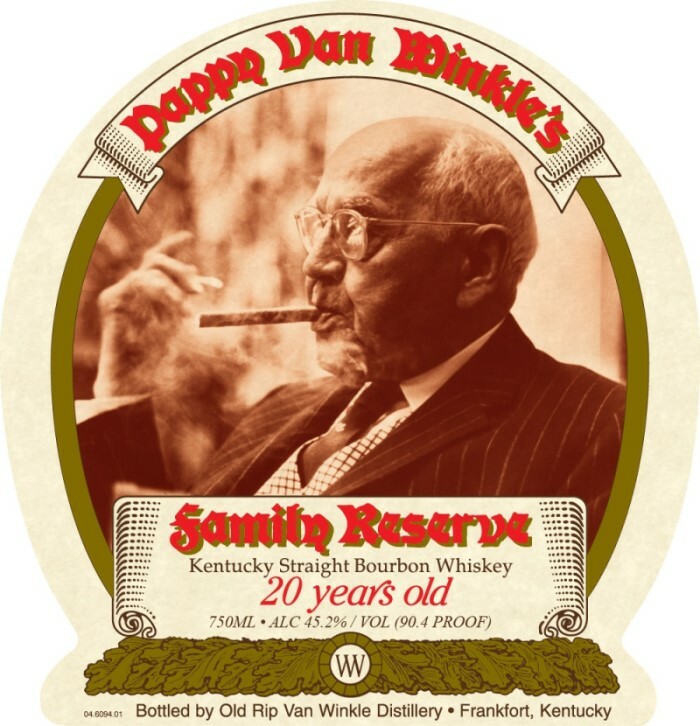 Win a Bottle of 20-Year-Old Pappy Van Winkle in Our New Raffle! As part of this year’s Kids with Cancer Golf Scramble, the Frankfort Elks Lodge is holding a very special raffle. The holder of the winning ticket will receive a bottle of 20-Year-Old Pappy Van Winkle! This bottle was graciously donated by our friends at Buffalo Trace Distillery, and we would like to extend our thanks to them for their generosity. Tickets are $25 each, and only 750 will be sold. The winner will be drawn at 8:00 PM on May 11 at the Frankfort Elks Lodge following the golf scramble. You do not need to be present to win. To buy tickets, you can contact Mark Skeeters at (502) 545-2415 or stop by the Frankfort Lodge at 309 Lewis Street. If you’d like to play in the annual golf scramble, sponsor a hole, or donate a prize, you can find all of the information about the scramble at this link. 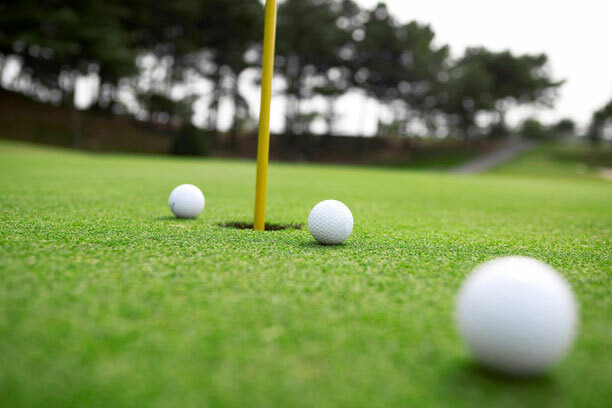 This year’s Kids with Cancer golf scramble will be held on Saturday, May 11 at Juniper Hills Golf Course.Lunch will be served at 12 noon, followed by a shotgun start around 1 PM. Just like in years past, we’re looking for volunteers, hole sponsors, and of course, golfers! The Frankfort Elks would like the thank the Frankfort community for all of its support over the years with this tournament. It couldn’t be successful without your help. We look forward to seeing all of you at Juniper Hills on May 11! From February 21 through the 23, nine members of Frankfort Lodge #530 attended the annual state convention of the Kentucky Elks Association in Hopkinsville, KY. Also in attendance were representatives from all 16 Lodges across the state, as well as special guests State Sponsor Lester C. “Ted” Hess and Indiana State President Randy Snellenberger and his guest Nancy Wells. On Saturday, Charlie Martin of Hopkinsville Lodge 545 was installed as our new State President, and his wife Lana as the new First Lady. The officers and members of Frankfort Lodge #530 would like to extend our very best wishes for the coming year to Charlie and Lana, and we are looking forward to having them both come to Frankfort for their official visit. We’d also like to recognize and thank our outgoing State President and First Lady, Charlie and Troi Cunningham of Frankfort Lodge #530. They have been amazing representatives for our lodge and state over the past year and we are very proud of the success they have brought to the Kentucky Elks Association. This past weekend, our Frankfort Lodge held its annual Angel Tree Christmas Party. Needy kids from around the community were treated to a meal of pizza and treats. 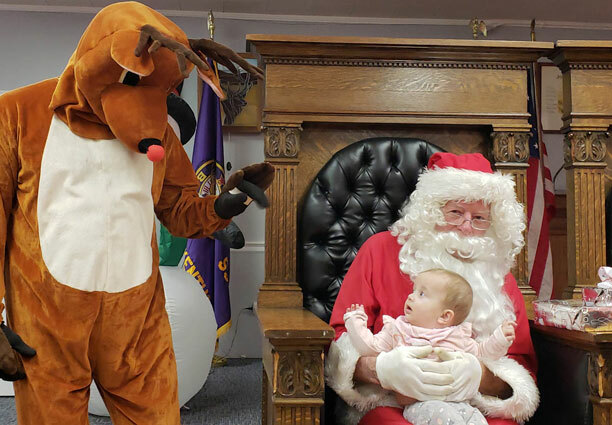 After everyone had eaten, Santa Claus came to visit, and brought along Mrs. Claus and Rudolph as well! Each child received a stocking full of treats, and was able to open a gift during the party. They each took home a stack of additional gifts as well. As you can see above, Santa was a big hit with the kids. Many thanks to all of the members who shopped for gifts, wrapped gifts, and helped plan and put on the party. We’d also like to extend a special thanks to everyone who purchased an Angel Tree ornament to help fund the party. You can check out all the pictures from the party in the gallery below. Our Frankfort Elks Lodge has been growing of late. In fact, we led all Kentucky lodges in membership growth for the 2017-18 year. We’re looking to keep the momentum going this year, and this week, we made a big step in that direction by initiating 22 new members into the lodge. 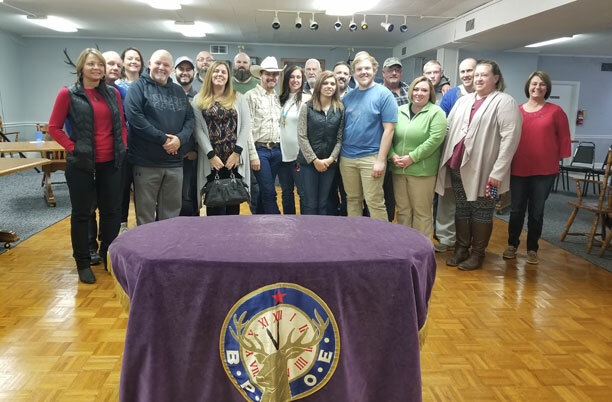 This is one of the largest initiations we’ve held at our lodge in many years, and we’re excited to welcome all of our new Elk brothers and sisters. Our new members are pictured above. If you see them around the lodge, make sure you welcome them! Come on down and show us how smart you are with our Tuesday Trivia Night Competition!